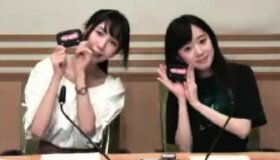 This was the third broadcast of Myoujin WiFi Radio. Sawako has never been to Guam before. But she has been to Saipan. When she was in Cambodia, Haruka fell alseep in the airport and missed her flight. So she had to buy another ticket for the next flight. When Sawako went to Hawaii (on her second trip), they had opened her suitcase for inspection. But they didn't close the cosmetics (liquid) completely, and it opened up and spilled all over inside her suitcase. So Sawako now puts her stuff in ziplock bags. Then Sawako and Haruka did a short skit, which was an advertisement for Imoto no WiFi. They did the English game corner again. In the foreign otaku event information corner, Rena talked about a cosplay event in the Phillipines. She said she wants to cosplay Lanka (from Macross).